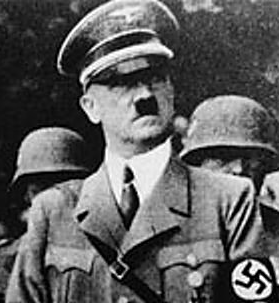 Hitler, by all accounts, was an unusual soldier with a sloppy manner and unmilitary bearing. But he was also eager for action and always ready to volunteer for dangerous assignments even after many narrow escapes from death. Corporal Hitler was a dispatch runner, taking messages back and forth from the command staff in the rear to the fighting units near the battlefield. During lulls in the fighting he would take out his watercolors and paint the landscapes of war. Hitler, unlike his fellow soldiers, never complained about bad food and the horrible conditions or talked about women, preferring to discuss art or history. He received a few letters but no packages from home and never asked for leave. His fellow soldiers regarded Hitler as too eager to please his superiors, but generally a likable loner notable for his luck in avoiding injury as well as his bravery. On October 7, 1916, Hitler's luck ran out when he was wounded in the leg by a shell fragment during the Battle of the Somme. He was hospitalized in Germany. It was his first time away from the front after two years of war. 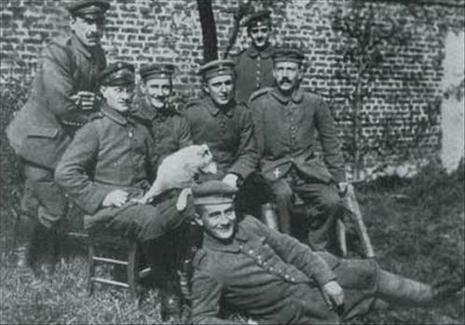 Following his recovery, he went sight seeing in Berlin, then was assigned to light duty in Munich. He was appalled at the apathy and anti-war sentiment among German civilians. He blamed the Jews for much of this and saw them as conspiring to spread unrest and undermine the German war effort. This idea of an anti-war conspiracy involving Jews would become an obsession to add to other anti-Semitic notions he acquired in Vienna, leading to an ever-growing hatred of Jews. To get away from the apathetic civilians, Hitler asked to go back to the front and was sent back in March of 1917. In August 1918, he received the Iron Cross first class, a rarity for foot soldiers. Interestingly, the lieutenant who recommended him for the medal was a Jew, a fact Hitler would later obscure. Despite his good record and a total of five medals, he remained a corporal. Due to his unmilitary appearance and odd personality, his superiors felt he lacked leadership qualities and thought he would not command enough respect as a sergeant. As the tide of war turned against the Germans and morale collapsed along the front, Hitler became depressed. He would sometimes spend hours sitting in the corner of the tent in deep contemplation then would suddenly burst onto his feet shouting about the "invisible foes of the German people," namely Jews and Marxists. Hitler described his reaction in Mein Kampf: "There followed terrible days and even worse nights - I knew that all was lost...in these nights hatred grew in me, hatred for those responsible for this deed." Not the military, in his mind, but the politicians back at home in Germany and primarily the Jews.